Fans of Brandon Mull and James Riley will love this action-packed, accessible fantasy story about one kid’s journey to discover magic as he’s caught up in an epic battle between two powerful ancient orders. Twelve-year-old daydreamer Joey Kopecky’s life has been turned upside down. After acing a series of tests, he’s declared a genius and awarded a full scholarship at a special (year-round!) school. He’s understandably devastated, until he takes one last test, and the room around him disappears, replaced by the interior of an old theater. There, Joey meets the washed-up magician, Redondo the Magnificent, and makes a shocking discovery…magic is real, but sadly, there isn’t much left in the world. It may be too late to save what little remains, but for the first time in his life Joey wants to try—really try—to do something big. 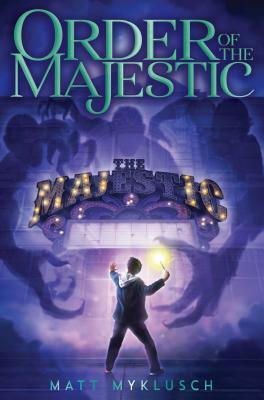 Soon he’s swept up into a centuries-old conflict between two rival societies of magicians—the Order of the Majestic, who fights to keep magic alive and free for all, and the dark magicians of the Invisible Hand, who hoard magic for their own evil ends. The endless battle for control of magic itself has reached a tipping point. For Redondo and the Order to survive, Joey must inherit the lost legacy of Harry Houdini. Will he prove himself worthy, or will the Invisible Hand strike him down? The answer will depend on Joey’s ability to believe, not just in magic, but in himself. Matt Myklusch lives in New Jersey with his wife and two sons.